The Kojonup Hot Rod Club was formed in the early 70's and immediately fared well with local and visiting drivers, Being surrounded by numerous South West Clubs created racing opportunities from visitors, particularly neighbouring Katanning drivers. At the time the club had built a track off the showgrounds road and closer to the Albany Highway than the 2nd and more known track, the first track was only used for about two seasons before the new track was built next to the Showgrounds. Allan Worrol recalls: the main thing i remember about the 1st Kojonup track was the fact that it was on the side of a masive hill so if you got turn 2 wrong chances were you may of ended up in the town of Kojonup itself. An early array of FC Holdens , station wagons and even a Zephyr ute entertained early spectators, The Caldwells, The Savory's and even Len Blazyks purple and orange ute were there in those early days "B" Stock and Standard Saloon's made up the early program which was broken up with the kid's bicycle races on the infield. A year later at Kojonup Solos were racing, even formula 500's grew in popularity and a local named Merv Robinson had fronted in a Super Modified. On March 27 , 1975 a Kojonup team comprising of Merv Robinson, Mac Caldwell and Colin Campbell defeated the more fancied Bunbury Team of Eddy Gobby, Mick Tripplett and Chas Thompson 18 points to 12 in an interclub challenge series, That day three brand new car appear at the Kojonup track, Robert Evans and Charlie Lyttleton in "B" Stock and the debut of Merv Robinson's new Torana. It was probably around 1975 when things started to happen at Kojonup. Robinson driving the "Street n Strip" Torana went across to Katanning and brought home the Woodanilling Hotel Trophy. In 1975, to win an open championship at Katanning you would gain $40.00 and a sash. It was also decided that year that sedan divisions 1, 2 and 3 would all compete in the same 15 lap feature on a handicap basis, Visiting drivers had the gate admission refunded on presentation of the purchased ticket, not uncommon, a count of tickets sold determines correct attendance figures. A local Mini Bike Club approached the Speedway about competition on the infield, Before they knew it, they could have been running what today is known as Pee Wees. Things became a little more series in the later part of 1975, they changed the name from the Kojonup Hot Rod Club to the Kojonup Speedway Club, They also became incorporated and finally presented members of the club with a constitution. December 1975, Merv Robinson was club President, the club was paying visiting drivers a massive $2.50 tow money and paying the Kojonup Shire $15.00 per hour for the use of the Council's grader. In 1976 the club approached the Shire regarding relocating to the Showgrounds which had better facilities for spectators, The fact that the club didn't relocatesuggests that they did not present its case or in fact they did and it was rejected. The club carried on and presented new ways of raising revenue, an idea was put forward at a committee meeting that the club charge for members to compete in a competitive roo shoot with funds returning to the club. By the time the National Super Sedan tital at Newcastle Motordrome was on us in January 1981, Robinson had upgraded to a later model Mustang, The earlier car remaining in the club in the hands of Bob Ness. Allan Baker recalls: at this time I was living in Sydney temporarily and had driven to the Motordrome for the tital, many of us camped on site, either in the car park or in the pits, The large contingent from WA had camped in the pit area, it was here i met Merv and Necia Robinson for the first time. Butch Boys had become president in 1987 , Merv Robinson had separated and left town,even retired from racing, Standard Saloons were allowed racing rubber. Allan Baker Recalls: In 1982 I was back in Perth permanently, a weekend road trip took in the Kojonup Open Championship on the Saturday and the Narrogin Open Championship on the Sunday, we slept over in the pits at Kojonup before moving on early the next morning, This was my first chance to see Kojonup Speedway in action. The Kojonup verses Bunbury match race was a triumph for the home team when Merv Robinson, Mac Caldwell and Colin Campbell raced away from the Bunbury team, Eddy Gobby Mick Triplett and Chas Thompson to win the two by four lap series by 18 points to 12, The only roll-over for the day was after the finish of the B stock feature race, won by Ron Estberg. The division one feature race went to Mick Triplett. The day saw three new cars on the Kojonup track, Robert Evans in 90 B stock, Charlie Lyttleton in 101 B stock and Merv Robinson in his division one Torana. There were 10 starters in the ladies race which was won by "Speed Queen" Joan Campbell. Boyup Brook racer Grant Wardel turns the Torana upside down on the Kojonup track. Like so many Speedway competitors before him, Bob Ness actually started out racing Karts back in the late 50's, It was in 1961 when Bob won the WA 160cc Class State Tital at Cockburn Raceway, The Kart was powered by a Czechoslovakian CZ engine. It was during the 1984-85 Season that Bob was talked into going speedway racing by Merv Robinson, Bob had been with Merv a few times and decided he'd like to have a go at it, Robinson was racing the the newer 85 model Mustang but still had the earlier 66 model parked, Bob took over driving the car and had his first hit out at the old O'Callaghan Park venue in Katanning. Together Bob and Merv travelled to many venues around the South West, Mt Barker, Bunbury, Waroona, Darkan, Narrogin and Collie to name a few. Bob recalls racing against competitors such as Graham Wake (Katanning), Noel Edmunds (Bunbury) Sid Streetfield in the days when Sid had his SLR 5000. The late start to his career in speedway was no handicap as Bob soon began beating many of the younger drivers around at the time. At home in Kojonup the competition was hot with not only Merv Robinson, but add locals"Wizz Cochrane" and "Butch Boys and we had some full on racing. The 66 "tang" was raced for another three or so years when a major upgrade took place, the chassis was two long so it was cut down by six inches in the wheel base, Bob rebuilt the front end and Merv helped attach his second set of "85" panels, presto, Twin Tangs in Koji, The upgraded car then debuted at Collie Speedway, the car was actually doing quite well until Bob lost a rear wheel and was towed infield. Back at Kojonup Bob helped out as muck as he could volunteering with track prep and general duties around the racetrack, One of his best racing results was a second in a forty lapper at Bunbury whilst his favourite meetings were always the day meeting at Easter at Margaret River, Continued support from Merv saw "Kojonup Hi Performance" appear on the car as a sponsor, Even after Robinson had given up racing, he still supported Bob Ness. In later years engines were sent to Allan Nylander, Bob Ness was one of the first Div 1 sedans to run methanol and again Nylander assisted in the conversion process, Bob retired from racing and eventually moved away from Kojonup, but his recollections are now recorded and his contribution to Kojonup Speedway remembered. "Butch" Boys started his Speedway career in stockies where he learned his racecraft, His introduction to Speedway was under the influence of good friend and mechanic John Barrett. His first car was an EJ Holden that was given the nickname "Lamb Chop", The first of the torana's came along , a dark blue car and it got called "T-Bone", Butch says it was better than a lamb chop. Butch Boys raced at many of the Southern venues including Albany where he shared his car with fellow Kojonup racer Peter Cochrane in the Standard Saloon 100 lapper. In the early 80's the car travelled across to Corrigin where the Torana did "Double Duty" on the day. John Barrett raced it in standard saloons whilst "Butch" drove it in the super sedans, The car won both divisions on the day. Boys has raced at many tracks including Margaret River, Mt Barker, Manjimup, Albany and both Katanning venues. He won the last open championship at O'Callaghan Park. For years both "Butch" and his wife Lynn served time on the Kojonup Committee, Butch being President for two years. He found it difficult being President, all the running around makinf sure things went to plan, he was also a track curator so the racecar found itself parked up in the garage on Kojonup racedays. But that's the kind of things dedicated club people do, its people like "Butch" Boys who kept the Kojonup club afloat right to the very end. Long before the original Kojonup Speedway ever openned, a local farm boy got the urge to go speedway racing. Better known as a Sedan driver, Merv Robinson actually started his racing career as a Super Modified driver at tracks such as Darkan, O'Callaghan Park Kattanning, Mt Barker, Narrogin and Boyup Brook. Merv raced the Super Mod with a 186 ci Holden motor against country competitors such as Steve Herbert, Kevin Costello (Mt Barker), Tony Caldwell, Syd Harder and Merv Hulland. An accident in 1974 after Merv and Des Hicks run wheels at Katanning saw the Robinson mod in a sad state, The car was rebuilt only to be completely written off in a huge dump in the back straight at Mount Barker. Exit one Super Modified, enter one LC Torana, With the car came new found success. The old South West Series saw clubs such as Kojonup, Katanning, Mt Barker, Collie and Boyup Brook compete against each other with Merv scoring many points for his club, In March 1975 Merv was part of a victorious team from Kojonup (Robinson, Mac Caldwell and Colin Campbell) who defeated the more fancied team from Bunbury (Mick Triplett, Eddy Gobby and Chas Thompson). A big South West win came for Robinson in May 1975 when he beat home a quality local field to win the Woodanilling Trophy at Katanning in the Street and Strip Torana. After the Torana had become a little outdated Merv Robinson built the first of the Mustangs. The original car was a 1966 coupe that Merv converted to a speedway sedan. Not only did the car have a lot of success in the South West, Merv ventured further North and took on the bright lights of the larger Claremont arena. Merv also picked up a state tital at Mount Barker. After notable time with the big boys in Perth, Merv decided to haul the "Tang" across the Nullabor to contest the Australian Saloon Car Championship at the Newcastle Motordrome in January 1981. Most of the WA entrants camped in the Motordrome pit area for the weekend Merv and Necia Robinson were no exceptions. At the Nationals, Merv finished in second place in his first heat, beaten home by by Adrian Anderson, a fifth in his second heat and a disaster in the third coming from the rear of the grid. A poor finish in the third Semi Final left Merv as first reserve for the Championship Final, Merv suited up and waited, hopefully, a withdrawal would allow him a start, It wasn't to be. After returning from Newcastle it wasn't long before a later model Mustang was under construction. The 1966 Mustang going to local competitor Bob Ness. The new Ford Mustang found itself caught up in the left hand drive controversary at the time, it appeared as a Super Sedan, a Grand National and a Super Sedan yet again, It was also configured in both Left and Right Hand Drive modes. At Ellenbrook in 1983 Merv contested the State Tital with little joy but returned later that same year and won the Late Model Grand National, then a prized trophy on the Ellenbrook calender. As a Grand National the car travelled extensively, covering the North West as well as Merv's second venture across the Nullabor to a National Tital, this the 83/84 season, It was the year the tital was run as a series over three venues, the car misbehaved and overheated. At Geelong Merv finished a creditable fourth in his heat, this got him into the Semi-final. He sat 12th on the grid in the final, the best of all the West Australians, He was to finish sixth in the round one final collecting valuable points. From Geelong the troop moved on to Premier Speedway at Warnambool , The Warnambool effort was looking promising when Merv won his heat race, But that was were the gremlins began to play havoc, Merv didn't start in the final. He moved on with the rest to the final round at Speedway Park in Adelaide, On points Merv sat in tenth place prior to the start of the meeting, he qualified for the final of the third round and sat twelth on the grid, The overheating gremlins persisted and a disappointed Merv brought the car home to Kojonup, When Merv took the car to his mechanic to have the problem fixed, the car, untouched by human hands had corrected itself and at Claremont the following meeting won the Coca Cola Sedan Feature race, hard times and divorce followed in later years and Merv retired from racing. Whizz started his racing career when he purchased a Dodge V8 Super Modified from Herb Robinson. At this point Kojonup didn't have a speedway so Cochrane travelled to other country venues to learn his racecraft, O'Callaghan Park Katanning and Bridgetown Speedway's in particular, He was to win his first race in 1972 at the Katanning venue. Fellow Kojonup racer Merv Robinson was also racing Super Modifieds at that time and the two travelled together to many meetings, Cochrane's first big meeting would have been his 5th place in the South West Championships at Bridgetown. His second Super Modified had a 202 Holden engine with tripple SU Carbies, he travelled with the race car extensively, tracks such as Mt Barker, Albany, Katanning, and was even runner up to Darkan's Ron Knapp in the South West Motorsport Championship the year it was held at Waroona, The Super Modified also got to race at Kojonup's first speedway track. 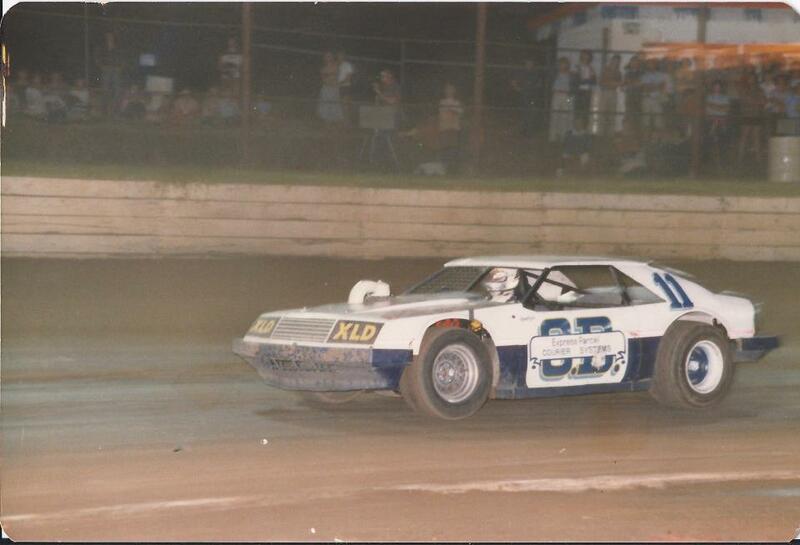 After years in Super Modifieds he jumped ship and joined the sedan ranks, Cochrane purchased an LJ Torana roller and slotted in the Holden engine from the Super Modified. It was around 1974, He raced at Kojonup's first track, and the usual Katanning, Mt Barker, Albany etc, but now he had ventured further afield and took on the Bunbury boys at there home track, racing against guys like Colin and Butch Harper and Ivan Burke. By 1978 and 1979 Cochrane was having his best year, running regulary at Bunbury and nominating for State Titals, he won the 1979 South West Championship for sedans at Margaret River and also remembers a meeting at Lake Grace where he fought hard all day with Esperance driver John Goodlad. In those days, the top Division 2 drivers were often invited to compete in the Division 1 events, "Whizz" found himself competing in the State Tital round at Esperance. The tital was held over 4 rounds and each feature was 30 laps in distance, for some reason at Esperance the white flag came out at 19 laps, All hell broke loose and Drivers threatened to boycott following rounds. At the next round, held at Collie, it was decided to run the remaining laps prior to the start of the Collie meeting, A lot of drivers refused to participate and Cochrane found himself winning the Esperance round at the Collie track, his winnings were $500, a lot of money at the time. After the Torana it was time to upgrade, he purchased a Commodore from Kalgoorlie, whilst it was a good car, it was iffy in its construction, it was half mono and half kit car. Whizz chose not to get envolved in the politics around the specifications and didn't race at Bunbury or Claremont and concentrated on the country venues. In both 1981 and again in 1982 Cochrane won the open championship at Narrogin, In 1982 he also won the open championship at O'Callaghan Park in Katanning. 1983 saw wins at the Open Easter Championships held over 2 rounds Saturday at Mt Barker, then down to Albany on the Sunday. On May 7, 1983, at the Kojonup Open Championship (also a round of the Oval Track South West Mini Trail) Cochran won the Koji sedan tital from Ellenbrook's Graham Clarke. When I asked "Whizz" why he quit racing speedway, he replied, The missus didnt like sleeping in a race car, she wanted a house, he then added that he started his own business building sheds across the South West and business and family come first. Whizz lists his most respected rivals as his 2 closest mate Merv Robinson who also sponsored me and Ivan Burke. 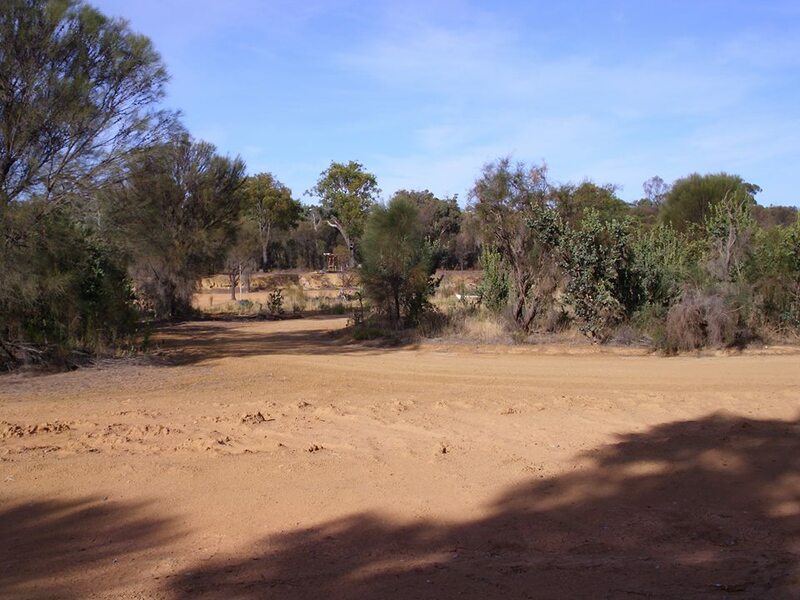 The original Kojonup Speedway is almost lost, as it was built on the side of a hill water errosion has destroyed most of the track, over time it apears small saplings have been planted by the shire right through out the racetrack to stop some of this errosion. The track surface itself is in very good condition in fact good enough to race on ,The infield is over grown with new vegetation and there is only a small amount of erosion to the front straight gravel embankment . Most of the timber uprights are still standing but the panels have not fared so well, the exception being patches through turn 1 and 2 and a small section on the back straight. The control tower has been burnt down and the flaggies platform is lying on the track where it fell, one of the public address cables leading from the control tower to turn 4 is still connected but no speaker. Nearly all of the front straight spectator wire fences are still standing; some sections still have the keep off safety signs attached. All of the sites buildings have not stood the test of time and the vandals, but the pit board is still standing proud at the race track enterance. 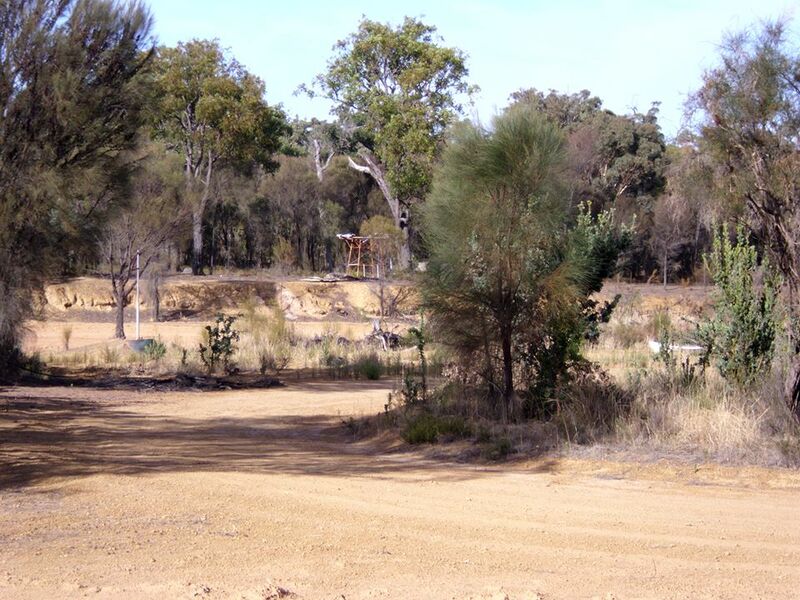 2011 - What remains of the dirt Go Kart track on the infield of Kojonup Speedway. Photo's Allan Baker.